When we gaze into the vast expanse of our galaxy and see those twinkling little orbs of light, we know what we’re looking at are stars, but this word we use to encompass these celestial wonders is far from accurate. Yes, they are indeed stars; however there is a vast difference between stars. And how they are categorized will definitely give you pause-for-thought the next time you’re out star-gazing. 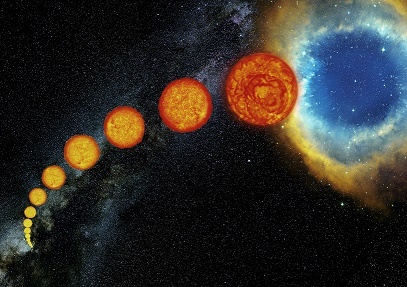 Let’s explore the phases of a star to help shine a light on this extensive topic. This is the “conception” stage of a star and happens when gas from a molecular cloud contracts. Over the course of about 100,000 years, pressure and gravity continuously force this mass down. As the “gas clump” collapses, these little particles all run into each other because of the heat they are producing. The force of gravity now converts this heat to energy and as the clump becomes warm enough, it will produce a lot of infrared and microwave radiation — this is the protostar! Fun Fact: The Protostar can reach temperatures of up to 3,000 Kelvins, which is hot enough for it to emit a dull red glow. Because this baby star is surrounded by a disk of gas and dust, it blocks any visible light from escaping. This is the second phase of a star’s evolutionary path. At this point the T Tauri is basically a big ball of gravitational pressure (which is all that is holding it together) and the source of all its energy. At this stage the star doesn’t have enough pressure or heat at its core to create a nuclear fusion; however, it does possess large areas of sunspot coverage, intense X-ray flares and very high and powerful stellar winds. Fun Fact: Although the T Tauri star is extremely hot, it is not hot enough at its core to ignite the hydrogen and helium which is what it needs to move into its next phase. This process usually lasts around 100 million years! When a star finally moves into this stage it is beginning to convert its hydrogen into helium, which in turn begins to release a tremendous amount of energy. This is scientifically known as “hydrostatic equilibrium” and is a fancy way of saying the gravity in the star is pulling it inward, while the light-pressure from the fusion is pushing outward. All this push and pull is what gives the star its round-shape and where its size will be determined — Main Sequence stars can be as small as 0.08 times the mass of the Sun, up to 80 times the mass of Jupiter and in theory, up to 100 times the mass of the Sun! Fun Fact: Our Sun is a main sequence Star and in fact, the majority of all stars in our galaxy, and even the Universe, are also main sequence stars. The length of time a star spends in this stage varies. The Sun will be shining for about 10 billion-years! When a star has consumed all of its core-hydrogen, fusion stops, so the star is no longer generating any outward pressure to counteract the inward pressure (which is pulling it together). However, the shell of hydrogen encasing the core will ignite and continue the life of the star making it dramatically increased in size — up to 100 times! Fun Fact: Once all the hydrogen is burned up, helium and other heavier elements will begin to be consumed. This phase only lasts a few hundred million-years. This stage is when the star has completely burned through all of its hydrogen fuel and can no longer force higher elements into a fusion reaction due to its lack of mass. The outward light pressure from the fusion reaction also halts and the White Dwarf then collapses inward under its own gravitational force. The White Dwarf will still shine because it was once very hot, but will begin to cool down to eventually become the same temperature as the Universe. Fun Fact: No White Dwarf has ever actually cooled down to meet the Universe’s temperature as this process takes hundreds of billions-of-years! This star is still in the main sequence stage, but it has such a low mass it’s much cooler than the Sun. A Red Dwarf is still keeping its hydrogen fuel mixing at its core, so it’s able to conserve this fuel much longer than other stars. In fact, scientists estimate some Red Dwarfs can burn up to 10 trillion years and are thought to be the most common star in the Universe. Fun Fact: The smallest red dwarfs are 0.075 times the mass of the Sun, yet they can still have a mass up to half of the Sun’s! When a star is about 1.35 to 2.1 times the mass of the Sun, it won’t form a White Dwarf when it dies, but rather goes out in a huge supernova explosion — its outer layers blow off — leaving behind a small dense core that continues to collapse. Gravity then presses the material so tightly into itself that it crushes together protons and electrons, which in turn forms the neutrons or Neutron Star. On average, gravity on a neutron star is 2 billion times stronger than gravity on Earth. Fun Fact: Because Neutron Stars pack their mass inside a 20-kilometer (12.4 miles) diameter, they become so dense that a single teaspoon would weigh a billion tons! As the name implies the largest stars in the Universe are the Supergiant stars. These “unstable” stars live very fast lives (from 30 million to few hundred-thousand years) as their consuming all of their hydrogen fuel at a tremendous rate. Supergiants can be between 10 and 70 solar masses and range in brightness from 30,000 time the luminosity of the Sun to hundreds-of-thousands. These stars most often detonate as Type II supernovae at the end of their lives. Fun Fact: There are two types of Supergiant Stars; red and blue. Blue supergiants are much hotter than their red counterparts; Rigel in the Orion constellation is a Blue Supergiant. Name a star now! - They’re Not Just Stars!